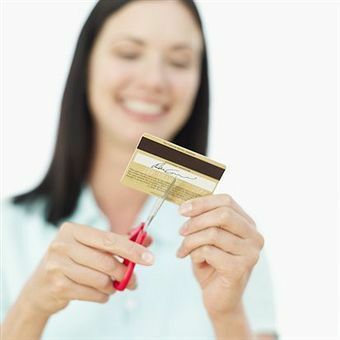 According to data compiled by CreditCards.com the average credit card debt per household is $15,799. With all the political talk of austerity and getting the U.S. debt under control, individual consumers might want to tackle credit card debt and put more money in savings accounts instead of the hands of credit card companies. Paying off debt allows you to accumulate more wealth. If your goal is to become debt free; the quicker you act, the better. 1. Organize your credit card obligations. Before you tackle credit card debt you have to know your debt. Grab your current credit card statements and tally up the amount owed. This is the only way to get real with credit card debt; painful as it might be. A good idea would be to review your purchases; undoubtedly there will be one, two or several items you could have done without. 2. Stay within your credit limit. You may think your credit card company is so wonderful because they let you go over your limit and make purchases without the worry of being denied. Be warned, the only reason why you have this freedom is that it earns the credit card company interest. It is not about your convenience. A credit card company may allow you to accumulate as much debt as possible, go over your limit, pay only the minimum and even skip a payment or two but it is costing you. Your debt is increasing while their profits are increasing. Contact your creditors and inquire about negotiating a reduction in your debt. Settling credit card accounts for less than what is owe is possible but it could seriously affect your credit score. Many times credit card companies that agree to settle your accounts for less may report the accounts as “settled” on your credit reports. A “settled” notation on your credit reports can lower your credit score because it indicates you did not pay your obligations as agreed. But another result may be you get a 1099 IRS form from the credit card company because they decide to write-off the portion of your debt you were able to knock off. You have the weigh the pros and cons of negotiating a settlement. 4. Prioritize credit card debt. Paying down the highest-interest rate credit card account first will help get rid of your debt more quickly. Once you tackle the highest-interest rate debt, you will discover you have more money to tackle the lower-interest rate credit card accounts. It will become second nature; just keep moving down your list until all debt is paid. 5. Credit Card Consolidation Loan. The more credit cards you have the more you may benefit from a consolidation loan. A consolidation loan will help you tackle credit card debt head-on. Paying off your credit card debt will give your credit score a boost which is an additional benefit of being debt free. The consolidation loan should be a reasonable interest rate and terms no more than 3 years.